Bryan Smith is an Arizona native and has been flyfishing in and around the state for the past 15 years. Drawn to the sport by the thought of designing his own lures to catch fish, he started tying flies 13 years ago. 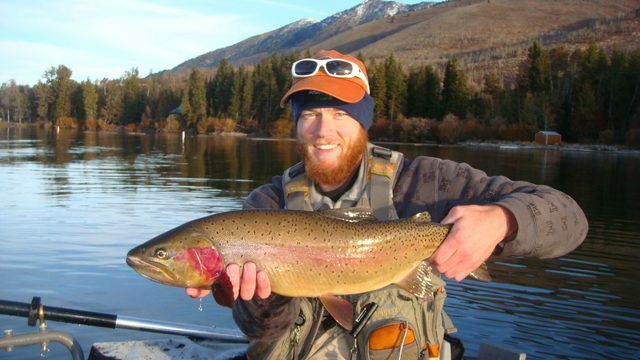 He landed his first fish on a fly rod at the lower Salt River in the mid 90’s and instantly switched gears from conventional bass fishing into becoming a trout bum. He teamed up with Travis about 6 years ago and the two have hammered out many innovative patterns and techniques for larger Arizona trout. He mostly ties trout patterns, however recently started tying some warm water minnow based patterns for the desert lakes and rivers. Daryl convinced him to start tying commercially last year and he’s been at it ever since…..although you sometimes have to push him to deliver them and not fill up his own boxes. If you happen to bump into him on the water, don’t hesitate to bug him about what patterns and techinques might be taking fish.